The superhero RPG is my least visited RPG genre but one that I've been interested in playing. 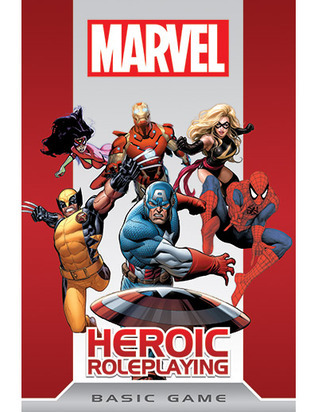 I've played a couple superhero RPGs in the past (the original Marvel Superhero game by TSR and Heroes Unlimited by Palladium) and when this particular Marvel game originally came out, I heard good things about it and purchase a copy. A few years later I was finally able to run a game and it played a lot better than I originally thought it would.I not going to go into a review of the game mechanics (as you can search online for an in-depth review that would have all this information), but the base mechanics are opposing die rolls between the player and the Watcher (GM) based on environmental factors, a character's powers and skills and the ability to add or changed dice in your dice pool by triggering power effects and activing "1's" that are rolled by the opposing roller. What makes this system shine is how the dice being used are based on specific effects and how you would use the results to tell a story. This game is very much a story-telling game with spotlights on the characters as they take their actions and reactions. The dice used and results dictate the action (similar to the Fantasy Flight Star Wars game but without all the glyph deciphering of the dice and without challenge in interpreting some of the dice combination results). For the most part, this game is a railroad with the Watcher creating the sequence of events and the players only having minor choices in what actions they choose to take (this might not appeal to some players who enjoy a more sandbox-type game and I suspect that the Watcher could create a sandbox game if their willing to put in more work).But the players and Watcher telling a story and describing the action in a scene is the highlight of this RPG. This makes the game really enjoyable to players that enjoy that kind of thing while players who are mainly into dice/number-crunching might not get much enjoyment out of this game. Also, characters earn XP based on reaching personal milestones, and this XP can be used to unlock some interesting story-enhancing benefits and boost a character's powers slightly. I don't feel this system will appeal to players that like to constantly pick from a number of feats, attribute increases and talents/skills every time they level. Character playing longevity doesn't seem to strongpoint of this game (unless you enjoy playing character that doesn't change stat-wise but could change story-wise as a game goes on- like I said, I feel that this game is about the story). With that being said, I enjoy playing RPGs for the story you create and the story and social aspect of RPGS are very important to me and the group of gamers I play with, but speaking for my gaming group specifically, the re-playability of this game appears limited (I see it being good for a one-shot or to play in-between adventure arcs of the main game being played). My players like building a characters and choosing new skills/talents, feats and such when they level up their characters. They like their long character sheets with lines of weapons and equipment. This isn't their type of game, but it still might be yours. Edit: Having played this a few times now, I'm raising my rating. My earlier comments on the game's weaknesses remain, but have been rendered unimportant in actual play, while the game's strengths shine through.This is an interesting set of rules. More so than previous versions of the Cortex Plus system, this one is very much a merger of the Cortex and FATE rules. Without having actually used the rules to play a game yet, I think that they will do a good job of capturing the feel of the comic books in play when using existing characters.The weaknesses of the game, as I perceive them, are twofold. The first is that creating your own unique characters is not supported very well by the system, it is much more focused on creating and playing characters that already exist in the Marvel universe.Second, the Marvel universe itself is not that interesting to me since the events of the Civil War. This is more of a personal factor given that I stopped reading Marvel Comics back in the early nineties, and am not that interested in the events that have occurred since then. That won't keep me from trying out this game, and possibly trying to create Events from the comics of the late 80s and early 90s that I enjoyed so much.Overall, I recommend this to anyone seeking a system that captures the feel of comic book stories. I was in love with this from almost the beginning.I'm a Marvel fanboy. Have been since I can remember. It's no surprise that I've got a bias for anything that captures the flavor of the genre so well. The mechanics were all new to me when I read this.I've since absorbed a good bit of Fate (via the amazing kickstarter for Fate Core) and I can say this system has a lot more in common with that than with vanilla Cortex. Aspects in Fate are Distinctions in MHR, and stress tracks are vaguely similar between the two. (in Fate they represent avoiding damage, in MHR they represent damage itself) Aspects are awesome. They are amazing.We played a pickup game of this after hours of silent reading and absorbing and digesting the rules. Love rolling huge handfuls of dice and the Yahtzee die-manipulation that follows. After one or two rolls you really get the hang of it and it moves more quickly than you might expect.The usage of Distinctions in MHR is absolutely what sold me on Aspects in Fate, so I don't consider this game a knockoff, it's sincerely flattering inspired-by material - and more importantly, it is custom-built for comics-style story play. The mechanics actually aid the development of the story in a real Marvel way, honest to Stan.If you love Marvel (or superhero comics period) and innovative RPGs, you owe it to yourself to pick up a copy. Some of the organization of material leaves a bit to be desired, but the layouts are slick, the art selections are dead on, and once you wrap your head around the rules you will be amazed how smoothly it plays.We've actually not played with homegrown characters, and I realize chargen is one of the weaker points in the book. But the more plot- and character-driven rules and physical gaminess of this game make it all too easy to have an amazing time.Pick it up! The system is a lot more narrative focused than most other games I'm familiar with, but I feel like that works well for a game based on comic books. While the rules section is short compared to many other RPGs, I feel that it does a good job covering everything. Although I haven't yet read the Breakout comic (I do plan to do so soon, thanks to reading this), I think it was a good choice for a first scenario. It includes a fair amount of action, some interesting information, and lots of plot hooks the Watcher can expand upon in subsequent adventures. The main weakness is that I feel like a lot of iconic characters are missing from the profiles. I would especially like to have seen some version of Hawkeye, Thor, and Hulk to make running games based on the movie universe easier. Having played a lot of D&D, I was very interested to play this game due to the difference in game play. With no board and rules that allow you to jump from pannel to pannel as if in a comic book, it was something that sounded very odd to me. After playing through the first scenario a few times, I found that it actually allowed players for more control of the action and allowed them to do what they wanted. As long as you can explain what skills you are using to do a task, you can do it (Against the DOOM POOL!). At such a low price point ($20), I highly recommend it to players who are looking for a system where they can play their choice of hero or create one of their own. Game on! This game was poorly written. The rules themselves once teased from the text provide a cinematic way to play a super-hero campaign, but should you need to look something up from the rules having an electronic copy is the only way to find things. The rules are poorly organized and hidden inside large blocks of text. The graphics are pretty, but given that it is a game about comic books, it should have fantastic knock-out art. Just re-read this in prep for a game I'm running in under an hour. I'm currently in love with this game. It is, by far, the best game I've ever played in at re-creating the feel of a Marvel comic. The system is a mix of traditional game and story game, kind of like a FATE light. It sounds confusing and complex at first but once you start playing it flows very well and the learning curve isn't nearly as steep as it seems. Seems like an interesting system. I don't have near enough knowledge of the Marvel universe to ever actually consider running in (and the list of villains in there is WEAK), but at $12 for a used copy it was worth a read. Pretty book, I'll give them that, but I think this game really needed a little more direction. Plus the dice rolling system is way to fiddly and complex, especially for new players. It could have been so much better. loved it. Great way to role pay. Not trad rpg but very very well done. A really solid game. It is sad it ended so quickly. My low grade is not a comment on how the book is written, but more on the game play rules themselves. The book's organization leaves a lot to be desired, but the game itself seems well-crafted and fun. Cam Banks Rob Donoghue Jack Norris Jesse Scoble Aaron Sullivan Chad Underkoffler Amanda Valentine Matthew Gandy - I am an expatriate New Zealander who fell in love with an American and moved to the USA in 1996. We are now married and have two boys. I've fulfilled my lifelong dream to become a game designer and writer and live a pastoral existence here in Saint Paul, Minnesota. I work for Atlas Games as brand manager and production specialist as well as picking up freelance game design projects on the side.